While people may generally know insulation is beneficial, few people receive an education on how many benefits it has, and more importantly, how to properly design an insulation system based on the unique conditions around that system. The National Insulation Association’s (NIA’s) research has found that most engineers and specifiers receive no training on this prior to starting field work. While there is value in learning as you go, you may not get the chance to understand the full picture. To this end, NIA has developed—sometimes with the help of other construction industry partners—a number of educational tools. Another part of NIA’s mission is to demonstrate that insulation’s benefits are incredible and also, easily quantifiable. The following tools can help users learn how to properly design, specify, install, and maintain insulation, leading to a host of benefits for their facilities. maintenance, specifying materials, keeping your facility running smoothly, or for those who are new to the field. Available at www.insulation.org/training-tools/e-learning-modules, these modules provide data on the science behind insulation, help specifiers and system designers construct insulation systems, explain design considerations, and reveal practical data and case studies outlining potential energy savings. Those who complete the e-learning course are also eligible for educational credit from the United States Green Building Council (USGBC) and its sister organization, the Green Building Certification Institute (GBCI), as well as the American Institute of Architects (AIA); NIA also offers professional development hours (PDHs) for its completion. The Fundamentals of Insulation program was developed by NIA’s joint Associates/Distribution Committee and is designed to teach new employees how to optimize their customer service skills. The DVD is spilt into 9 modules of approximately 3–4 minutes each and cover Heat Flow Basics; Btus; Ks, Rs, and Cs; Insulation Selection Criteria; Cold and Colder Environments; Normal to Hot Environments; Super Hot Environments; Protective Coverings and Finishes; Specifications and Codes; and Selling Tools. 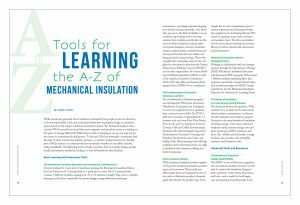 These learning tools will help employees learn information they can apply in insulation sales situation, making for a better bottom line. NIA’s Insulation Sampler provides samples of 20 generic mechanical insulation product types and accessories. These small, portable sample boxes are designed for ease of use, with an illustrative product schematic guide that denotes the product type. Each sample has its own compartment space to remain organized and undamaged within the sample box. In developing this kit, NIA aimed to represent many major mechanical insulation types. The kit is an excellent tool for your internal training and resource library, as well as external sales discussions and presentations. Working in collaboration with our strategic partners through the Department of Energy (DOE) Mechanical Insulation Education and Awareness (MIC) program, NIA created 3 different industry marketing flyers that promote, respectively, commercial and industrial insulation savings; the MIDG Simple Calculators; and the Mechanical Insulation Education & Awareness E-Learning Series. This brochure answers the question, “Why insulate?” It is an ideal tool for discussions about insulation maintenance or why you should undertake new insulation projects. It points to the many benefits of insulation, including energy conservation, enhanced employee safety, reduced energy costs and green-house gas (GHG) emissions, and more. The colorful and informative 6-page brochure also provides a list of helpful resources and insulation tools. The MIDG is one of the most comprehensive mechanical insulation resources on the web. It answers the insulation designer’s basic questions—what, when, why, where, and how—and is useful for both beginners and experienced professionals in the construction, design, specification, maintenance, and management fields. This advanced, detailed tool walks you through the steps to build an insulation system correctly. Find everything you need to know about the design, selection, specification, installation, and maintenance of mechanical insulation. The MIDG also links to NIA’s MTL Product Catalog, www.insulation.org/mtl, the only online library of technical product literature and videos for the insulation industry, searchable by product or company. If you are looking for detailed product information that can help with product specifications, these tools can be extremely helpful. The MIDG is available at http://tinyurl.com/gma4ads. These unique calculators are designed to make common mechanical insulation calculations easy for users of all levels. These tools make it easy to discover proper insulation thickness, financial and energy savings, and the ideal insulation design. Visit http://tinyurl.com/micalculators to see the different calculators available. NIA recently launched an online video streaming portal to expand its training and educational offerings and distribution. NIA’s Vimeo page contains archived versions of NIA business webinars on leadership and personnel, long-term business planning, health and safety heat-illness prevention on the jobsite, and injury reporting and recordkeeping. It also contains videos about the MIDG that can help users with their insulation installation questions. Additionally, there are videos of the manufacturer panels from NIA’s 61st Annual Convention, where 2 panels of manufacturing executives discussed issues currently facing the industry. On this site, users can also access NIA’s Mechanical Insulation Installation Video Series, which provide a general product overview, safety information, and a how-to guide for installing mechanical insulation for various applications. Each video incorporates consensus recommendations from the sponsoring manufacturers, and the applications demonstrated were completed by experienced field mechanics on piping and equipment mock-ups representing project applications. The videos are a great industry resource for supplementing existing craft training programs, as educational programs for new or existing sales or insulation service employees, and for indirect users to obtain an overview of application practices for the respective insulation materials. Visit NIA’s page at https://vimeo.com/niainfo/vod_pages to see all of NIA’s available resources. Insulation Outlook magazine maintains an online archive for ongoing educational purposes, including past columns detailing the physical properties of insulation materials or mechanical system design. These columns, available at www.insulation.org/io/ columns, contain information on insulation materials and finishes, and can be a tremendous resource for those looking for in-depth information on materials that can help with project specifications. The archive also has a series on understanding thermal systems that go into detail about how these systems work and how they should be designed. NIA is committed to helping insulation users expand their knowledge and learn more about the benefits insulation can offer to their systems. Insulation is a proven means for saving energy, reducing greenhouse gas emissions, increasing process productivity, providing a safer and more productive work environment, controlling condensation (which can lead to mold growth) supporting sustainable design technology, and host of other benefits. The resources above can expand your understanding of all the benefits insulation offers, and then lead you through the design process to ensure insulation is properly installed and maintained in your systems, leading to tremendous financial and energy savings, increased safety, and lower environment impact. Our website also offers updates on other NIA programs, activities, and insulation-related legislation. Visit www.Insulation.org to learn more. This article was published in the January 2017 issue of Insulation Outlook magazine. Copyright © 2017 National Insulation Association. All rights reserved. The contents of this website and Insulation Outlook magazine may not be reproduced in any means, in whole or in part, without the prior written permission of the publisher and NIA. Any unauthorized duplication is strictly prohibited and would violate NIA’s copyright and may violate other copyright agreements that NIA has with authors and partners. Contact publisher@insulation.org to reprint or reproduce this content.